In a recent Boca Raton accident, a tractor-trailer drove through an overpass guardrail and crashed onto the southbound lanes of I-95. The driver was hospitalized with non-life-threatening injuries and, thankfully, no one else was hurt. There has been an ongoing problem with this Congress Avenue intersection and this is the fourth tractor-trailer accidentin one year at the site. All 4 drove right through the intersection and either dangled over the highway or fell below. What's the problem? When exiting the highway, there had been inadequate warning of the upcoming traffic signal and a sharp turn. After an accident at the same spot killed one person earlier this year, the Florida DOT installed signal warning signs to try to alert drivers to slow down. Another improvement was to remove straight arrows from the lanes that are designated as turn lanes only. But none of these modifications will help if drivers are not paying attention. And in the most recent semi-truck accident at this spot, the driver was allegedly falling asleep at the wheel. A recent Federal Motor Carrier Safety Administration (FMCSA) study reported that, in the study group, driver fatigue was a factor in 13% of large truck crashes. This result points to the dangerous fact that many large truck drivers are operating their rigs while sleepy or with inadequate rest. The FMCSA issues hours of service regulations that govern the working hours of an individual operating a commercial motor vehicle. The goal of the regulations, which are enforced by each state's DOT, is to reduce driver fatigue. Sleep deprivation and the effects of cumulative fatigue contribute to driver fatigue. Another factor is disruption of sleep patterns, also called Circadian rhythms - your 24-hour internal clock that governs your sleep/wake cycle. Sleep disorders such as sleep apnea, where the individual regularly suffers from interrupted sleep, can also cause driver fatigue. 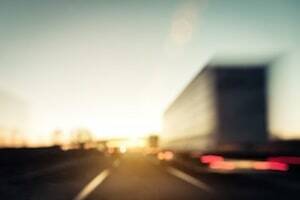 Because tractor-trailers are so much heavier and longer than other smaller vehicles, an accident can result in serious injuries and even death. While hours of service regulations encourage driver rest by limiting driving hours, some trucking companies pressure drivers to deliver their cargo quickly. Drowsy driving can be as dangerous as driving under the influence of alcohol or drugs because judgment is impaired and reaction times lessened. If you or a family member has been harmed by a car and truck accident or slip and fall, or has been injured by any other type of personal injury, please contact the Law Offices of Diana Santa Maria, P.A. immediately. Our experienced attorneys will fight for the compensation you deserve. Please call us for a free consultation. Attorneys Diana Santa Maria and Laura D. Dolin, personal injury attorneys in Fort Lauderdale, will fight to secure justice for you and your family. You can reach us at (954) 434-1077 or contact us via the website.